"Old Principles in a New Age of Image Making"
Where real talent gets a real chance at development and promotion. Create the right image and back it up with solid foundations. The Sight Sound Group is with you every step of the way. Does one have to be a different or even a little crazy to be artistically successful? Answer: If by crazy we mean having some mental condition, then no. But it wouldn't hurt to be different (just a little). We confess to being " a little different" because we believe strongly in giving anything a try. What does it take to make it; to be successful at something? Answer: Let's start with Passion (notice the capital P). The team at The Sight Sound Group can be accused of many things but being short of passion isn't one of them. Answer: The applause you first give yourself and then the applause of everyone else who follows. It's getting those other applauses that we get hung up with at times. Combine a ridiculous amount of hard work, an obsessive addiction to commitment, add a little sprinkle of luck and wham ..one is on track to answering this twisted question. I'm I ready for this? Let's talk (or write). Our consultation costs nothing but a little time. Start by clicking here to drop us a line. It seems simple but its really not. The answer, for one thing, shouldn't be etched in stone...and yes, you might even be in for a few pleasant surprises with yourself. Knowing who you are is the first step to figuring out where you want to go and if you can get there. Answer: We wouldn't dare be so silly. Here's were we come in. We sit down and help you assess not so much the level of your talent, but rather the means necessary to unleash, articulate and if possible exploit the talent within you. 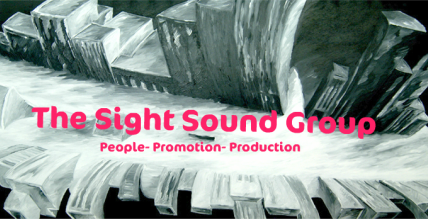 The SightSound Group pledges to work hard for you to reach your goal. Unlike most agencies and entertainment firms, we give you, the upper hand in determining the path set out to be taken. No doubt we will suggest (even strongly suggest at that), certain avenues that we feel meet your credentials and potential, but we first and foremost believe in building partnerships and not dependencies. "To be heard, read, looked at, admired, valued, get paid or just contribute something meaningful to mankind". Did we miss something? Mind you, the last one really covers a lot! Point is...know first what you want to do and then let's have a good honest talk on how to get there. Keep it simple no matter how difficult the success rate might be. No one ever makes it home (at least in one piece) with blurry vision. We can show you how to achieve this three step approach. "Because I can't wait any longer"
The Sight Sound Group consults artists in musical, video, book and photographic production. However we don't just stop there. We put theory into practice working on your project from A to Z, down to the most finest of details. By choosing The Sight Sound Group to handle your project, you can focus on the one thing you should be: Your Art.. The Sight Sound Group works with the most reputable studios, publishers, marketeers and agencies in the New York Metro area assuring that your work will be seen, heard and above all promoted.